Workers aren’t getting their fair share. Retail, fast food & warehouse workers are working harder than ever before but wages have flatlined. While the cost of everything else is going up – from electricity bills to school supplies and rent – wages are not keeping up. Wages must keep up with the cost of living. Workers need to provide for their families and save for the future. We do not want to end up like the U.S. where retail and fast food workers have to work two or three jobs just to make ends meet. Low wage growth isn’t just hurting Australian workers, it’s bad for the economy when workers have less to spend at local shops, businesses and restaurants. That’s why the SDA and the whole union movement is fighting to Change The Rules that have allowed wages to stagnate. Are you struggling with the rising cost of living? Support the campaign below! Do you agree that Australia needs a pay rise? Tell us why you need a pay rise. Help the campaign to win pay rises for retail, fast food and warehouse workers. We will use your story to highlight how workers aren't getting their fair share. The SDA has been at the forefront of campaigning to protect penalty rates. In 2009, the SDA won fair penalty rates in the Retail Award when they were introduced, and we have been defending them ever since. We have opposed every submission by employer lobby groups to unilaterally cut penalty rates. We made a strong legal case to protect penalty rates across the retail, fast food and pharmacy industry Awards in the Fair Work Commission. The Fair Work Commission’s decision to cut penalty rates, despite recognising it would leave workers worse off, was unfair for the hundreds of thousands of workers who rely on them to get by. There was no lift in the base rate to compensate for the change in penalties. It was a straight out cut to take home pay. The SDA appealed this decision alongside United Voice, the union for hospitality workers, all the way to the Federal Court. While we were unsuccessful in appealing the decision, we are now leading the charge to restore penalty rate cuts. Our only option is to change the rules by changing the Federal Government. The Federal Labor Party have called for penalty rates to be restored if they are elected and have made a commitment to taking action within the first 100 days of a Shorten Government. The minimum wage must be a living wage. One that allows a worker in full-time employment to have decent housing, a healthy diet, good quality education, healthcare, transport, electricity, clothing and contingency savings if something goes wrong. A living wage is key to stopping growing income inequality which we’ve seen the United States has created a working poor where retail and fast food workers have to work two or three jobs just to pay the rent. Negotiating Enterprise Bargaining Agreements is the SDA’s core business. For decades the SDA directly negotiated wage increases that resulted in SDA members being some of the highest paid retail and fast food workers in the world. However, bargaining new agreements to ensure your pay and conditions continue to improve has become increasingly difficult as loopholes in industrial laws allow expired agreements to continue without forcing employer back to the negotiating table. There are over 200,000 SDA union members across Australia, but unfortunately where there is not strong union representation in companies like 7-Eleven wage theft and not paying superannuation is rampant. 7-Eleven was a perfect example. There must be stronger consequences for employers who break the law by systematically underpaying workers. How are wages set in Australia? The SDA, the union for workers in retail, fast food and warehousing is over 200,000 members strong with members in every state and territory in Australia. Together we stand for a decent wage, fair working conditions and safe workplaces. The Fair Work Commission’s Annual Wage Review is a key part of lifting wages for retail and fast food workers. The minimum wage is the minimum amount any Australian worker can earn. Award rates of pay set out the minimum rates of pay by industry. For example, the General Retail Industry Award and the Fast Food Industry Award. An Enterprise Bargaining Agreement is specific to your Company and is negotiated directly by your union and your employer to make you better off overall than the Award rates of pay. The Annual Wage Review sets the increase to the minimum wage and Award rates of pay each year. The SDA believes the minimum wage must be a living wage. A wage that allows a worker in full-time employment to have decent housing, a healthy diet, good quality education, healthcare, transport, electricity, clothing and contingency savings if something goes wrong. That’s why the SDA strongly supports the Australian Unions submission to raise wages every year. Our submission looks at what is fair and reasonable, what’s happening with the economy, whether workers are getting their fair share and what workers are experiencing in their everyday lives. And each and every year, business groups make submissions arguing for a minimal increase or sometimes no increase at all. 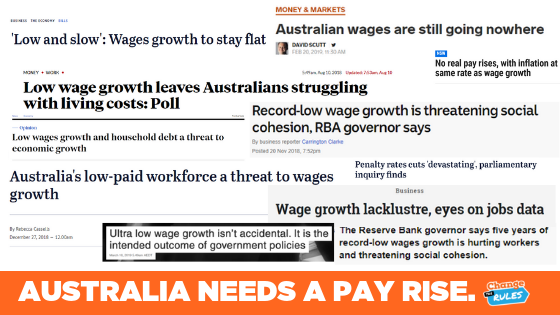 Australia has one of the best minimum wages’ in the world but the reality is wages are flatlining and inequality is getting worse. 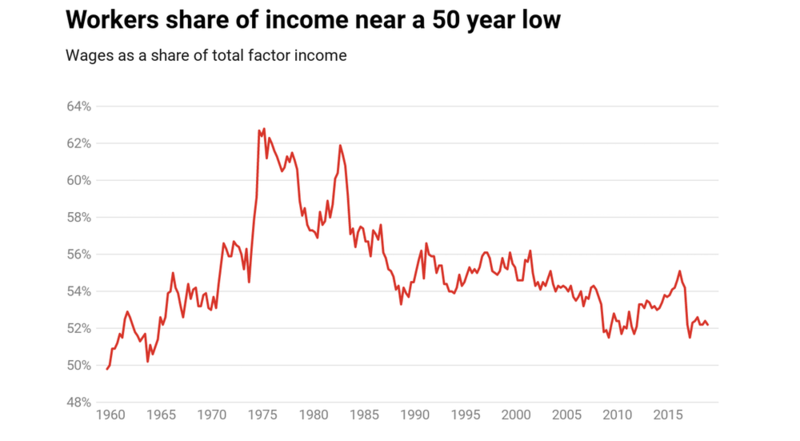 The gap between the rich and poor is growing and raising the minimum wage is key to curbing income inequality and maintaining the fair Australian way of life we all believe in. We know that the rising cost of living is putting pressure on workers – whether you’re at uni trying to study and pay rent or whether you’re a parent working part-time and trying to cover the cost of childcare. Pay rises are not given – they are won by unions and your union the SDA. The more members we have, the stronger we are and the more we can achieve. It pays to be a union member. Now is the time to encourage your work mates to join the SDA.